What are the qualities of a leader? 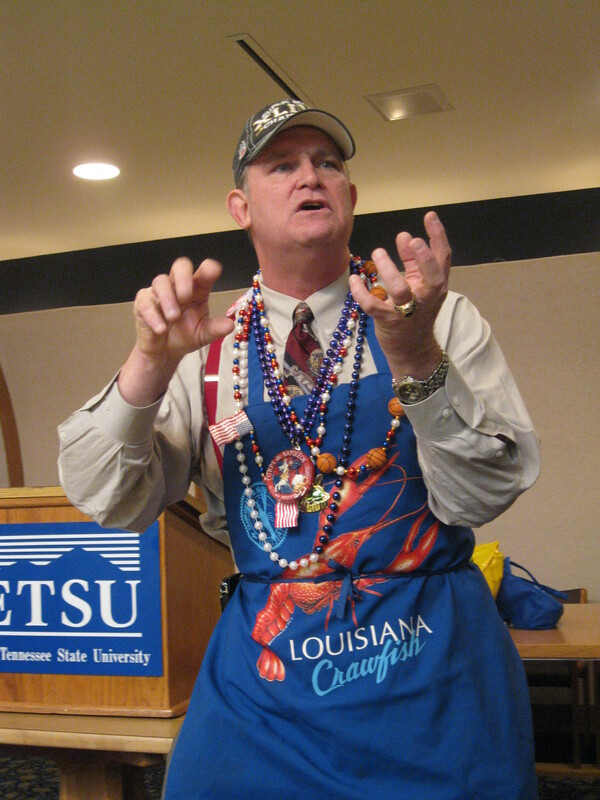 Dr. Joe Trahan, the southeastern district chair of the Public Relations Society of America (PRSA) recently took his Gumbo Leadership program to East Tennessee State University in Johnson City,Tenn. Just as creating good gumbo involves adding a little of this and a dash of that, Trahan reviewed the essential ingredients that make a leader. The proud New Orleans native says he waited years for last season’s Super Bowl win and he encourages others to persevere like the much maligned Saints. Noting that General George Washington led his men into the Delaware while holding a losing record, Trahan says it is that quality of perseverance that sets leaders apart. Here is his LEADER acronym with sage words to follow. L- Listen. with your heart, ears, and eyes. Give others your undivided attention. Listen for understanding and comprehension. O- Overlook. Don’t dwell on the negative. Instead, put people in places they excel. Look for their positive traits and what they do best. V- Voice. Lead from the front. Be strong and secure. E- Enthusiasm. Believe in what we do. E-Ethics. Be grounded in the right thing. Sometimes that is the toughest thing you’ll ever do, says Trahan. A- Action. A leader makes things happen. D- Determination. It will not go away. General Washington was determined to hold the revolution together when he decided to cross the Delaware River. E- Example. People watch what you do and what you don’t do as a leader. R- Responsiblity. Dr. Trahan quoted General Colin Powell talking to his troops, “If it’s done right you did it. If it’s done wrong I did it.” Take care of and responsibility for the organization when you are the leader and knock down barriers. What are your thoughts on leadership today? Do you agree with Dr. Trahan? Please feel free to comment. I think it is so cool that he began with LOVE! I talk often about this with the leaders I coach. I know it is uncomfortable for some to talk about love in the business enviornment, but I believe it is very risky to NOT talk about it … or to not open ourselves to love. I believe that our personal brands are simply our unique brand of love in our work. So again, I think it is wonderful that Joe begins with love. Go Joe! Thanks for the synopsis of his talk! Thanks so much for sharing this–love the idea of “gumbo leadership” with a little this and little that. And this presentation is an easy way to remember what is so important in leadership! Sounds like a very interesting presentation. Thanks for sharing it with us! My favorite part is that he started with love. What if we all started with love? Jeff commented on the same thing Melanie. It is real food for thought for a leader isn’t it? The gumbo analogy is fun! Thanks, MAry Ellen!